Shopping on Thanksgiving sends the wrong message to my children. A large number of retail stores have announced that they will open on Thanksgiving. I think I read that Kmart plans to stay open for something like 41 hours straight for their Black Friday sales. Really? Seriously? 41 hours? I won’t be shopping on Thanksgiving. I highly doubt that I’ll go shopping at all over the weekend. I’ve never been a fan of Black Friday sales. Maybe it’s because my first job was in retail? Maybe it’s because I don’t really like shopping? It isn’t because I don’t like saving money and it certainly isn’t because I don’t like buying gifts. I could blame it on not having any money to spend but some years I have had money to spend and still didn’t participate in Black Friday sales (and those were in the days when stores were actually closed on Thanksgiving and didn’t open until Friday morning, you know, after sunrise). But this post isn’t about Black Friday sales on Friday. This post is about shopping on Thanksgiving. It isn’t part of my family’s traditions. A few weeks ago a friend posted as her Facebook status that she didn’t agree with the “because everyone deserves a day off for family” shopping boycott. At first, I wasn’t sure that I agreed with her. I mean really doesn’t everyone deserve a day off to spend with family? Isn’t that a great reason to NOT shop the Black Friday sales that start on Thanksgiving? Maybe not. I sat and pondered and read through the comments and had one of those light bulb moments. She had pointed out that many many many people do not, have not and cannot have a day off at Thanksgiving. They deserve to have a day off but they can’t have it. Doctors, emergency responders, police officers, fire fighters, nurses, military personnel, guards and so many more must work. Their jobs are essential. My friend specifically mentioned pastors and restaurant employees. My mother-in-law is a retired nurse. She’s had to work her fair (unfair?) share of holidays (not just Thanksgiving, but Christmas and other holidays too!) over the years. My aunt is a nurse in a nursing home and provides in home care for some elderly patients. She also always works on Thanksgiving. My daddy worked for the Equipment Division of Public Works (usually for the Street Department). If snow needed to be plowed on Thanksgiving, he would have had to do it. One argument I read pointed out that if you shop on Thanksgiving you are part of the problem. What problem? The problem of keeping those retail employees from having the day off to spend with their families. Another article countered with “if you watch sports or enjoy sports or any kind of entertainment you are also the problem because those players, those concession workers, those coaches and others involved are working in order to entertain you and that messes up their their ability to spend Thanksgiving with their families. The counter point argued if you’re going to not shop because it employees have to work, then you shouldn’t do entertainment (other than board games which by-the-way is what my family does: play board games on Thanksgiving) for the same reason that those employees are also missing out on spending time with family. I think I agree with the idea of being consistent. I think it’s a valid point. But again, I’m not in a “Black Friday Rage” over people having to work on Thanksgiving. Maybe I was last year or the year before. I won’t say I haven’t heard myself complain about stores being open but this year I realized it’s more. It’s deeper. It hits at the core of why my family celebrates Thanksgiving. We don’t celebrate family. We don’t gather to just spend time with family and watch football. I don’t even like football. We celebrate Thanksgiving by spending time focusing on the blessings. We contemplate what we have and strive for being content with what we’ve been given. Even the year that my father died. His funeral was on a Monday, the Monday of Thanksgiving week. That had to be the most difficult Thanksgiving I have ever experienced. Thanksgiving isn’t about the food, the football, or even about having the day off. It’s about being thankful. For me, though, not shopping on Thanksgiving has little to nothing to do with keeping retail employees from spending time with their families on Thanksgiving. Do they deserve to spend time with their families? Yes, but not anymore so than anybody else who has to work that day. Those other people deserve time off too. It's not the *working* on Thanksgiving "because it keeps them from their families" that bothers me. The retail stores opening on Thanksgiving bothers me because of the rampant contradiction of being thankful and content with what we have. It's the commercialism and materialism that is promoted with all the special retail sales. There is no reason for retail sales to open on Thanksgiving in order to sell at a "special sale price" items that would and often are sold at the same price the next day. It just promotes greed: "Oh no If I don't stand in line and wait at Stuff-Mart for them to open then I won't get any of x, y, z." I won't shop on Thanksgiving. I won't do it because I don't like the message that it sends to my children. How can I focus on being grateful for my blessings and then cut dinner short so we can go buy more stuff? Yes, I know it is Saturday but I wouldn’t let myself post this yesterday because I wanted to get my book review and giveaway posted for The First Christmas Night. I don’t like posting twice in one day to my blog if I can avoid it. It just doesn’t feel right to not post for days in a row and then post multiple posts in one day. I just can’t do it. 1. On Tuesday November 19th my husband and I celebrated 19 years of marriage. Tailorbear, Turtlegirl, and Supergirl created a romantic “restaurant” feel for our special dinner which the girls helped cooked. Tailorbear even provided classical dinner music through her Spotify account for us! 2. Because Boobear is a music student, we get free/discounted tickets to the different music concerts presented. On our anniversary there just happened to be a Symphony Concert. Guess what? They did excerpts from Handel’s Messiah. Two of the college choirs provided the voices. I love the Messiah. 3. Also on Tuesday I got my email from Kate, Director of Product Reviews, letting me know that I was accepted for another year on the Crew! I am so excited! I joined the Crew in June of 2010 and it has been such a blessing for me and for my whole family. Looking forward to another year (starting in January!) of wonderful products and making new friends. 4. I started following the ideas of Trim Healthy Mama in the beginning of August. Today I am 15 pounds less of a person . I think I have a pair of jeans that I am just going to have to get rid of. They are “uncomfortably too big”. Never ever thought I would ever think of anything as uncomfortably too big but I’m getting tired of having to keep pulling them up when they start to fall down. 5. I am really bummed that we don’t have cable or satellite dish so I cannot watch the 50th Anniversary Special for Doctor Who. I had to console myself by going to a local shop that specializes in British treats. It’s a tea shop and a store. I really wanted to sit and order something like “Adipose soup” or the “River Song sandwich” but I didn’t have time so settled for “Don’t Blink Mini-Vickies” to bring home. Recommended Ages: Kids ages 4-8 but in my opinion enjoyable for all ages! As soon as I pulled the book out of the packaging, I was in love! This beautiful, hardcover book, written in rhyme captures the attention of both adult and child. It can be a quick easy read or you can slow down and savor each page. Keith Christopher is a composer, arranger, orchestrator, and educator, and he has served as editor and producer for several major music publishers. In addition to writing and studio producing, Keith served on the faculty at the Blair School of Music of Vanderbilt University in Nashville. He lives in Hendersonville, Tennessee, with his wife and two children. This is a fun book to read aloud. It starts out just like the familiar old Christmas poem but tells the story of the night Jesus was born. The full-page illustrations are beautiful and compliment the text perfectly. This book is the perfect Christmas gift for a young child. I think it would be perfect to give to a grandparent who has young grandchildren. The book, at the end, includes the Scripture passages from Luke and Matthew so when you are finished enjoying the poem, you can read the story of the first Christmas night from the Bible. I am so pleased and excited to be able to give one of these books away to one of my readers! As usual you must be 18 and older. US and Canada residents only please. This giveaway will only be available for a few short days. Winner will be contacted by email. This giveaway has now ended. Congratulations to Jared H.! Today in the van we started discussing our Thanksgiving menu. It seems like I make the same things every year. I thought maybe we could change things up a bit. Try something new or different. Nope. There are certain food traditions that must be adhered to or else apparently it just isn’t Thanksgiving at our house. I guess I can relate to my children. There were certain foods that my mom always served on Thanksgiving and if those foods were not on the table then it couldn’t really be Thanksgiving, right? Right! My mom always served turkey, stuffing, mashed potatoes, gravy, brown and serve rolls, this candied yam with marshmallow thing [it was so not my favorite but it was my sister’s favorite], cool whip with fruit cocktail salad thing [always a big hit with children] and pie, usually pumpkin. Some years she baked the pie and some years she bought the pie but we always had pie. We also always had a “relish tray” with different kinds of pickles and olives. Thanksgiving would not be complete though without the canned jellied cranberry sauce. I do remember at some point trying to encourage my mom to serve things like vegetables like broccoli with cheese sauce. I think once or twice we had some corn but otherwise I just don’t remember veggies gracing the dinner table. In later years, mom stopped with the brown and serve rolls and started buying those crescent rolls in a can. I loved those! So what foods do my children expect at Thanksgiving? Well for starters they expect caramel or cinnamon rolls or a breakfast casserole for breakfast. Though this year we’ll have to break tradition. I have no idea what I’ll make but Cream Cheese & Bacon Scrambled Eggs might be a possibility. We tend to eat later in the afternoon around 4pm though it varies anywhere from 3pm to one year we ate as late at 6pm! I don’t bother making a true lunch but I do make sure to have plenty of “snacks” on hand. I set out a relish tray with several different kinds of pickles and two or three different kinds of olives. Sometimes I have a spinach dip with bread or crackers. We always have stuffed mushrooms and home made Chex mix. I’m really surprised that we are ever hungry for the main meal! Not too much different than the staples I had growing up. I had never ever had green bean casserole until I had it at my brother-in-law’s house. I decided I loved it. I don’t know if Honeybear grew up with it at Thanksgiving but the green bean casserole is a nod to his family’s tradition as is the cranberry relish. My father-in-law actually taught me how to make cranberry relish. It’s yummy, especially when you spread it on turkey sandwich the next day! What foods must you have to make Thanksgiving really Thanksgiving at your house? It’s always a good idea to remember to be thankful any day or month of the year but there is something about Thanksgiving and the month of November that causes people to focus on being thankful. I’m joining with fellow crew members to participate in the Schoolhouse Review Crew Blog Cruise: on being thankful. Today, I focus on being thankful that as I celebrate 19 years of marriage (19 years on the 19th of November, isn’t that cool!) I still have my husband with me to celebrate. Regular readers of my blog may recall that my husband had a mild heart attack last June. Next month he’ll have another heart catheterization to see how that artery is doing. I’m thankful that he was there in June, after the heart attack, to celebrate our daughter’s 18th birthday and graduation from high school. He was there for her first day of college. I’m thankful for home schooling. It’s been an amazing journey to home school my oldest daughter all the way through high school. I’m thankful I get to do that for her sisters as well. I’m thankful for each one of my four beautiful daughters. Each one of them brings something special and amazing to the world and we are all better for it. I’m thankful for my church and my faith. I’m thankful for the Schoolhouse Review Crew. I can not imagine how we would have continued to home educate our daughters without some of the incredible products and curriculum that we’ve reviewed. I’m thankful for my marriage. Marriage is hard work. I am thankful that we haven’t given up. I’m amazed that we’ve made it to our 19th anniversary but grateful that we’re still together. And oh so grateful that he’s still around to fight with and love with and grow with and learn with. Happy 19th Anniversary (on the 19th!) to my Honeybear. But most of all I’m thankful to have things to be thankful for. Visit the Schoolhouse Review Crew Blog to read more posts from crew members on being thankful! Wow, half way through November! I missed last week. 1. Today is November 15th. For Orthodox Christians who follow the revised Julian Calendar the Nativity Fast begins today. This is the least restrictive of the 4 fasting seasons with Fish being permissible more frequently. The Fast begins on November 15 for those who are on the Old Calendar but old or Julian Calendar is 13 days behind the Revised calendar so OC will start the fast on November 28th. 2. My Orthodox friends and I joke that on fasting days shrimp becomes a vegetable. We’ll be eating shrimp at least once a week for the next 40 days. The rest of my family loves shrimp. I am still learning to tolerate it but I have found a few things I like. 3. Today marked the final due date for the final review for the 2013 Schoolhouse Review Crew. The Crew Leadership will be tallying votes and announcing the winners of the Blue Ribbon Awards this coming week! 4. I may be finished with reviews for the Crew for 2013 but I do have some book reviews and a giveaway. I’ll give you a hint that the giveaway book is *perfect* for a Christmas gift. 5. I’m way to lazy this week to try to come up with pictures for any of my randomness and I’m even too lazy to come up with a real number 5! When the girls were all young we discovered the Young Explorer’s Series of science books written by Jeannie Fulbright and published by Apologia Educational Ministries. Supergirl listened in while we read books about astronomy, anatomy or zoology but she wasn’t quite ready for them to be directed at her until recently. With my other two girls currently studying Physics and Chemistry, the timing seemed perfect to review Exploring Creation with Chemistry and Physics Textbook and the accompanying Junior Notebooking Journal. This sturdy hardcover text contains 14 lessons. In the notebooking journal you will find a suggested Daily schedule for using Chemistry and Physics two days a week. Following this plan you’ll complete the course in 28 weeks. This gives you plenty of time to dig deeper or explore topics that grab your student’s attention. The purchase of the textbook also gives users access to the Course Website located at Apologia website. The book includes the web address and password. This Course Website has links to videos, demonstrations and other websites. These are listed lesson by lesson. Each lesson includes bolded vocabulary words with definitions, natural breaks with encouragement for narration with statements such as “tell someone all you’ve learned about . . .”, and Try This! sections with a fun hands on activity. At the end of every lesson are these three sections: Final Matters, What Do you Remember? and Notebooking Activities. Each lesson ends with an Experiment or a Project. The notebooking journal is the perfect accompaniment to the textbook. With the notebooking journal, I slow down and make sure that Supergirl is processing the vocabulary. It would be easy for me to just read through the textbook, do a few of the hands on activities and miss the opportunity to go deeper. My favorite part of the Junior Notebooking Journal is the Test It Out section which has activities and suggestions for going deeper. I love having book suggestions for every lesson. I love using a literature approach to studying and having a list of books that coordinate with the lesson topics means that we can read more books aloud and count it for school! The suggested Daily Schedule in the Junior Notebooking Journal lays out a plan completing each lesson in 4 days: Two days a week for two weeks. Supergirl and I prefer to work on science for a smaller chunk of time 4 days a week with the 5th day available for adding in any of the suggested videos or books from the journal or as a day to play “catch up”. I liked using the Daily Schedule as a frame or anchor so that I had an idea of what I should cover each week. I found that what seemed to work best for us was to do some reading and some activities until we finished the lesson in the textbook and then work on some notebooking activities like the mini-books. Supergirl would color the pictures and do some of the copywork in the journal while I read aloud from the textbook. dictate to mom a sentence or two or so for the Fascinating Facts based on what we just read. Though we have used several other science books in the Young Explorer’s Series this one is my favorite. It could be because the subject matter of chemistry and physics lends itself so much easier to hands on activities or it could be that Ms. Fulbright improves her writing with each book or it could be the fact that I am really grasping and understanding these concepts. What I do know is that Supergirl and I are enjoying this program and enjoying it so much that we want to share it with some friends from church. I also know that Supergirl is grasping and understanding these concepts. I really like the science activities. That’s my favorite part. One of my favorite “experiments” is the one with the mirror. I like to color the pictures in my notebook journal and I like the copywork. I like how they do experiments with water. I like doing science like my sisters. Science is fun. Visit the Schoolhouse Review Crew blog to read what others have to say about Exploring Creation with Chemistry and Physics. Some time ago some dear friends of ours hosted a Dramatic Skit and Reading activity. Though I chose not to participate in a skit or do a reading, I very much enjoyed watching my family (and friends!) participate. I love using real books to teach history and geography. Carole P. Roman has a series of books that introduce children to cultures around the world. Currently there are four books available and Supergirl and I had the chance to read and review them! All the books are subtitled: A Child’s Introduction to Cultures Around the World. Each book has 22-26 pages and each book has a pronunciation guide which is very useful! Most of the two-page spreads have text on one side and a full size illustration. What you would call your father or mother. I decided to use each book as a spine for a two week study (3 to 4 days a week) of each country. We started with Mexico and then moved on to France. Currently we’re working on South Korea. I want to save Norway to study when we can coordinate a visit with Granka and Grandma and have them share family stories related to their Scandinavian heritage. For each country we color a flag and mark the capital city on a map. I’ve also found videos and books at the library to explore a little more. It would be fun to also include a meal based on the foods described in each book. Book Series: If You Were Me and Lived In . . .
Age Recommendation: Preschool to age 8. Ideal even for all under 10 but can also be used with older children. Price: Each book is available for under $9!!! Supergirl and I have been enjoying these books and I look forward to reading more of them as they are released! Visit the Schoolhouse Review Crew blog to read what others have to say about these wonderful books from Carole P. Roman! I can’t wait to tell you about this book that Supergirl and I have been reading. Can’t-Wait Willow! written by Christy Ziglar and illustrated by Luanne Marten tells the story of Willow and the lesson she learns about making choices and learning to wait. Sometimes you need to say no. It can be better to wait. Save yes for the super amazing, and end up with the truly great! Willow is a young girl who has been waiting and waiting for the day of the Big Top Circus. The day has finally come and she is so excited. She’s been dreaming of cotton candy and seeing the show in the Big Tent, but as she walks from home to the circus she encounters fun things like the ice cream truck or playing with friends at the park and by the time she gets to the circus she has no more money to buy cotton candy and to make it even worse, the circus show is over. She missed it! She “couldn’t say no” to the ice cream truck, or the lemonade stand. Those were good things but she missed out on the really great thing: The Circus Show. This tender story has a beautiful ending when Willow is given a second chance and chooses to say no to the good things and gets to experience a really great thing! Excellent opportunity to teach and discuss making choices. Our culture seems to thrive on instant gratification. Our children need to learn that it is sometimes better to say no to something we want right now so that we can have something even better a little later. Excellent teaching tool for your children or would also make a beautiful holiday gift for nieces, nephews, grandchildren, godchildren or any child you love! Even though this is aimed at younger children my 14 year old daughter saw it on the coffee table, picked it up, read it and said “Mom, this book is good and has a great moral!” Supergirl is developmentally around age 6 and this book has been great for us. She loves the story and I’ve been able to talk to her about waiting and about making choices. This will be a book we read again and again. Christy Ziglar, financial planner, mother of twins, and niece of legendary motivator and the world’s original optimist, Zig Ziglar, is bringing the same timeless wisdom and ageless advice to an entirely new, younger audience through her new Shine Bright Kids picture book series. Do you live in the US or Canada? Then you can enter to win your own copy of Can’t-Wait Willow! to read to your own child or to give as a gift. Winner must be 18 or older. Winner will be contacted by email and have 48 hours to respond to the email. See Rafflecopter for more “fine print” details. I’m combing letters C and D this week because I just didn’t get a post written for the letter C. I’ve been implementing the principles of Trim Healthy Mama and have discovered that cauliflower and chicken are my new best friends. It seems many of my dinners involve cauliflower or chicken or both! Years ago when Low-Carb really hit the market with books like South Beach Diet and Dr. Atkins’s diet, I knew that subbing cauliflower was possible, even recommended. I have this vague recollection of trying to make fake mashed potatoes using cauliflower. And over the years I have added cauliflower to my potato soup to reduce the carb load, but things like cauliflower pizza crust? I had heard of it but just couldn’t bring myself to actually try it. Until recently. Now? Oh yes I’ll be making this one again! I did not create the recipe for the above crust but I will share the link so you can try it for yourself! Low Carb Pizza with Crispy Cauliflower Crust. I needed to come up with a way to cook the chicken using no added fat. In the summer it’s easy. I would just season with herbs and then have my husband grill them outside. But he doesn’t like to grill in the rain. (I guess I don’t blame him.) So I decided to “fry” my chicken breasts in chicken broth. As the chicken cooks and the broth is reduced you get a tasty very brown and family pleasing chicken. Yes I do plan on blogging the recipe just not right now. In addition to cauliflower pizza for dinner and seasoned boneless chicken breasts at dinner time I’ve made THM friendly Chicken Spaghetti for dinner. You might be thinking “ah, Tess, pasta isn’t part of a Trim Healthy Mama plan.” Well, there’s this pasta called Dreamfields that purports to have only 5 digestible grams of carbs which makes it suitable for those who are not food purists. The sauce was made with no sugar added, low-fat marina sauce. To make it an E (Energizing) meal I added carrots. It was good! What have you made for dinner using cauliflower or chicken? Come visit Ben and Me for the Letter D.
November? November?!!! Yes, I’m a bit shocked that November is starting. Time may fly when you are having fun but it races even faster when you’re busy or stressed. I missed last’s week edition. But here goes: 5 Random Thoughts for this first edition in November. 1. Honeybear had a follow up cardiology appointment. Tomorrow will be 4 months since his heart attack. It was not a nice appointment. Honeybear needs another heart catherization and this time the team plans on putting in a stent. This procedure is tentatively scheduled for next week. 2. Supergirl had an endocrine appointment. It went very well. Her thyroid levels are right smack in the middle and the doctor is pleased with growing progress. I am so glad the doctor put her on thyroid medication. We do not have to go back for a year. 3. 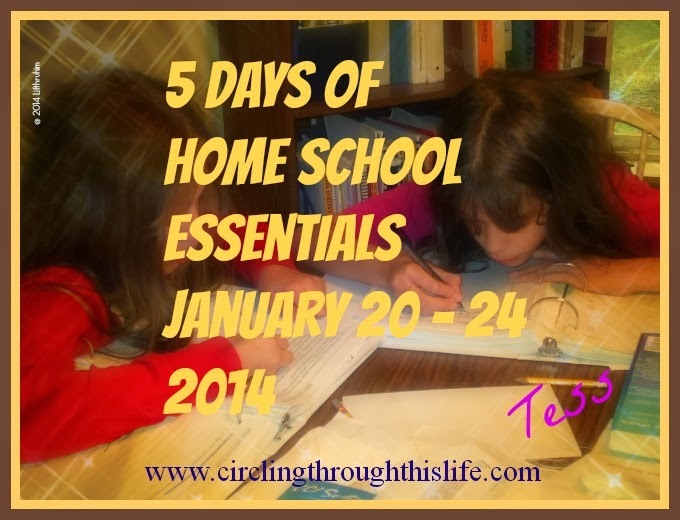 Do you read my blog posts and wish that you could be part of the Schoolhouse Review Crew? Well the Crew is now accepting applications for the 2014 Crew Run. You can go here to read some testimony from current crew members (like me!) and you can go here to check out the application requirements. More information and the link for the application is here. 4. One Princess, one Rock Star, and 4 friends makes one fun Halloween Evening. We had 75 Trick or Treaters come to our door last night. Down a little bit from last years 90 something but still fun to see the smiling faces and different costumes. Not pictured is Amy Pond and a Dr. Who alien that lives in the shadows.